Rats breed very quickly and prove to be problematic, especially in the household and surrounding areas. They leave disgusting faeces around a home and can even bite you in your sleep! They cause damage to your property and multiply at an alarming rate. What can you do if you are faced with such a rat problem? What products are best to use to rid you of these pesky rodents? Rat poison! We have listed the best rat poison that you can use in your home to rid yourself of these unwanted pests. This product contains Bromadiolone, which is a potent enough poison to kill them after just one feeding. Also, it claims to kills roof rats, Norway rats, and house mice; all rodents which typically plague households or outdoor areas. The bars can be split into 2 oz sections for the bait stations or to be mounted on walls. These convenient bars also feature special nibble edges that rats and mice love to chew. The price range is at the lower end of those we have reviewed, which is widely affordable for the effectiveness and convenience. This strong and bulk size rodent poison contains bromadiolone and diphacinone, two powerful rodent poisons to ensure the effectiveness of the product. This product also boasts that it is made with human grade food ingredients to increase the tastiness to draw the rats and mice to eat them. These chunx are a great option for wet or dry areas, since they are considered all-weather. They are available in 4lb and 9lb sizes. The price tag is worth how much you get, again weighing in at the bottom end for price. 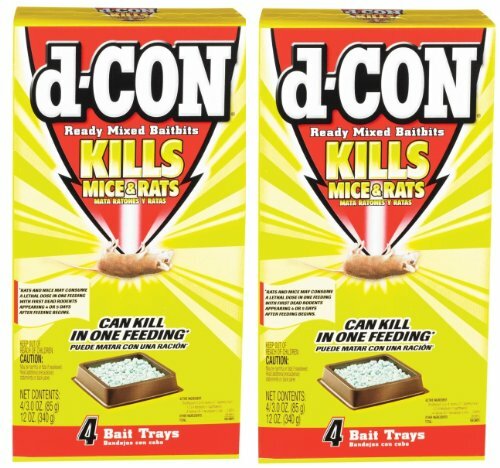 A trusted and popular name in rat poisons is D-Con. 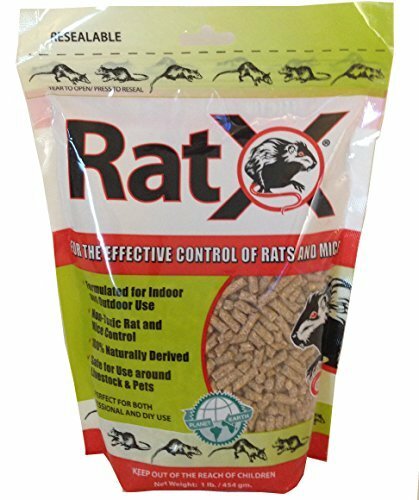 This product contains brodifacoum, which helps to kill rats or mice that are resistant to anti-coagulants found in other products. The rodents usually die within 3-6 days. 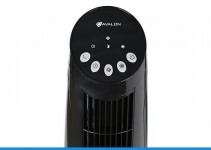 The price tag is a little higher than those above, but the product is reliable and effective. Unfortunately, the sales of D-con in the United States was discontinued in 2015. However, the product is available in limited supply, but it has been found to be the most effective available. This rodent poison contains diphacinone, which is best suited for smaller rodents and kills a few days after feeding. The product comes in a tamper-evident resealable pail, so that it can be stored safely for future use. 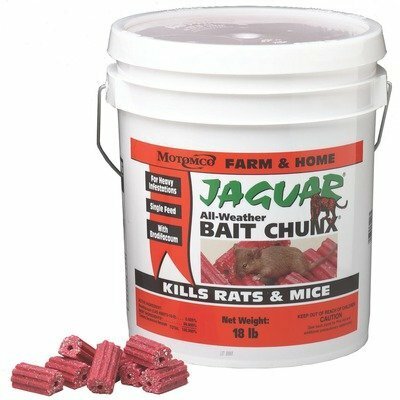 This pail contains 72 2 oz rodenticide blocks, which are peanut butter flavored to ensure rats and mice are tempted. 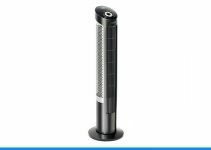 This product is ideal for garages or basements and comes with a 1 year limited warranty. The price tag is average within the market. One important caution: this item is not available for international shipping. This product is all-natural and perfect for the consumer who worries about pets or children. It is safe and non-toxic. Instead of using anti-coagulants, the active ingredients are gluten meal and sodium chloride, which causes dehydration in rodents. For the consumer, who is concerned with all natural and organic, this product suits their needs and is not very expensive. It comes in a resealable bag for future use. 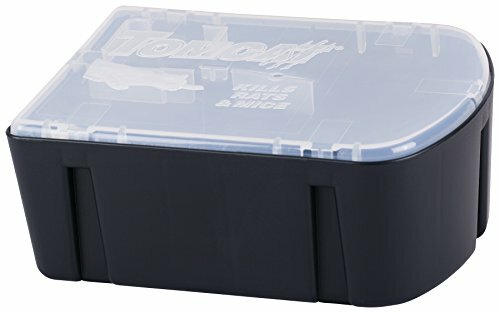 Another Tomcat poison but this time, it comes in the form of a bait station. 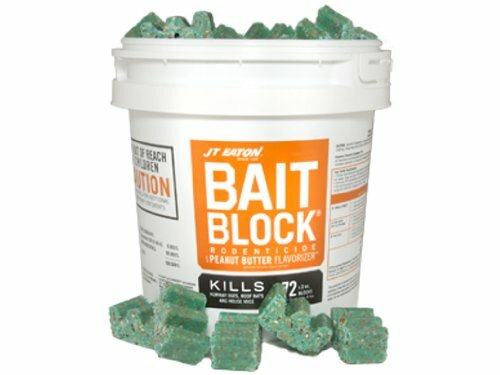 Bait stations are ideal for the consumers who have children or pets as a concern. It is also weather-resistant, so it is effective outdoors. This bait station comes pre-loaded so there is no need to touch the bait at all! 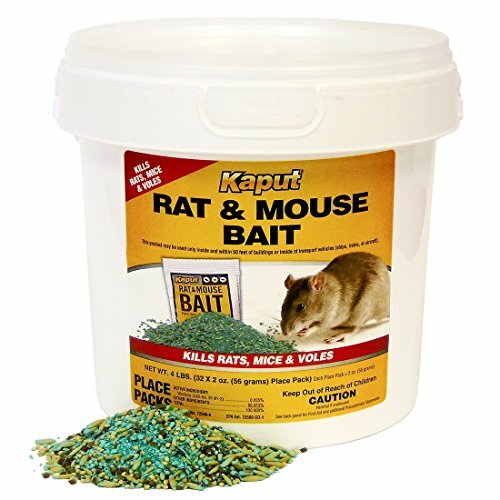 The bait is refillable and contains bromethalin, which is effective for killing all sizes of rodents. The convenience and effectiveness is worth the price tag, which is below the market average. This poison claims to be effective in especially tough infestations. These rat poison blocks are ribbed for enticing rodents to nibble. 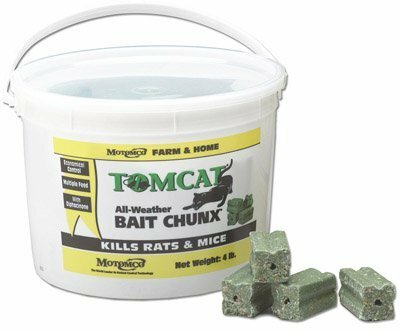 Each block contains diphacinone and brodifacoum, so the product is guaranteed effective against different sizes and varieties of rodents. The large size, 9 lbs, makes it a great choice for large scale infestations of the house or yard. The pail is resealable, making it suitable for future use. Also, the above average price is worth it to clean out tough infestations. These rat poison pellets contain Warfarin, which is effective against rodents. Also, it has a readily available antidote of vitamin K1, in case of accidental ingestion by children or pets. These ready to place 2 oz bait packs are convenient to use. Depending on your pest, you place the recommended amount of bait and watch your problem disappear over two weeks. It comes in 60 ready to place 2 oz bait packs and the price tag is very reasonable for what you get. Well-worth the convenience of the above average price. This poison comes with 1 station and 16 refills to help control minor pest problems. It contains the strong ingredient, bromethalin, which is effective against rodents. These child-resistance tamper stations are safe to use in the home or in the garage. 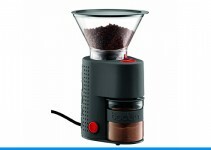 They only come with one station, it is refillable, but for the relatively small price, it is an affordable option. 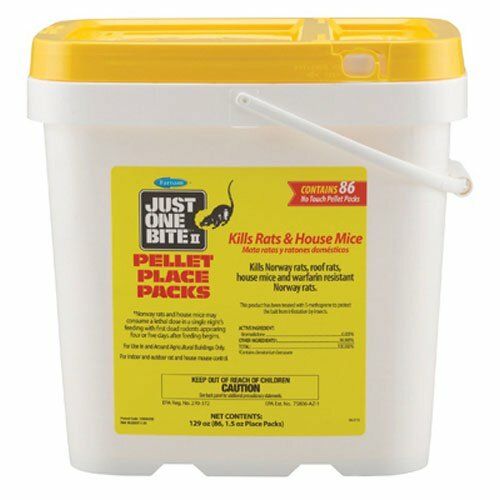 This convenient rat poison pellets is designed to kill over 4-5 days so bate shyness is not a problem with rodents. It is also designed to kill Warfarin resistant Norway rats. Warfarin is an alternative type of active ingredient in rat poison that is effective, but rodents can develop a resistance to it, such as the Norway rat. The active ingredient in Bromadiolone which although can kill after only one feeding, will take several days to kill. This poison needs to be placed away from children and pets, preferably in a sealed off area. If accidentally ingested, vitamin K1 is recommended, as well as contacting a poison specialist immediately. It is considered effective, especially in countries where certain rodenticides are outlawed.